This nature reserve has a lovely beach served by a good path from the car park, which is one of the major attractions of the area, but it is the tidal island of Worm's Head and the south-facing cliffs on the mainland that are home to some very special plants, birds and other wildlife that make this NNR such a wonderful place to visit. Gower Coast NNR is part-owned by the National Trust, and the nature reserve is managed jointly by Natural Resources Wales (NRW) and the National Trust. At Scurlage turn right onto the B4247 and continue, passing through Pilton Green and Middleton to Rhosili. The car park lies on the left-hand side of the road. The beginning of the paths from the Rhosili (western) end of Gower Coast NNR are hard and surfaced with pea grit, but these become firm grass-covered paths further into the reserve. The paths from the Mewslade Bay (eastern) end of the reserve consist of compacted stone and mud, which can be slippery when wet. Good walking shoes are essential. The path that leads down to the beach there meanders down through a small valley. Paths in other parts of the reserve (Thurba to Horse Cliff) are rocky, narrow and difficult. If you decide to walk to and from Worm's Head Island be aware that it is cut off during high tide and that you need to get information about the tide times (from the old Costguard Lookout 1km (2/3 mile) from the Rhosili Car Park). In no circumstances should you attempt to 'race the tide' if it is coming in, because the currents are swift and dangerous. 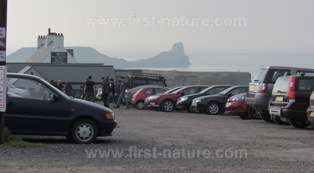 The Rhossili Car Park has direct access to toilets, a visitor centre with information, an exhibition and a café, shop and hotel. About 1km (2/3 mile) beyond the Rhosili Car Park there is an old Coastguard Lookout building which also supplies information about the area and which can provide tide tables for those wishing to access Worm's Head Island. 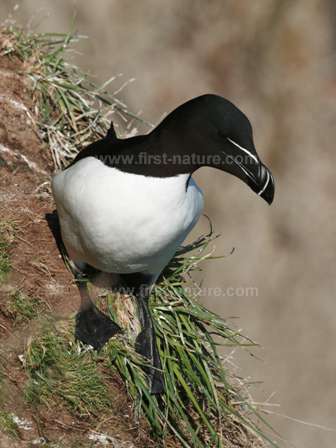 Razorbills (Alca torda) and Common Guillemots raise their young in the reserve, as do a few pairs of Fulmars and Shags. Curiously the numbers and species of gulls that breed at Gower Coast NNR have declined greatly, and now only a few pairs of Herring Gulls and Black-backed gulls can be seen there each year. Puffins once took over the rabbit burrows on Worm's Head and raised their families there as they do so successfully on Skomer, but as with other islands around the coast of Wales, including Ramsey, their populations have been destroyed by invasions of rats which have come onshore from the mainland or from shipwrecks in the area. Each year a few sightings of Puffins in the sea around Worm's Head raise hopes that they might, once again, nest on the island but there is, as yet, no evidence of this. Staying close to the sea from July onwards can mean sightings of other seabirds including Storm Petrels and Manx Shearwaters as they travel back and forth from their hunting grounds and nesting sites on other parts of the Wales coastline. Other interesting birds in the area include Choughs, which recolonised the area in the 1990s after an absence of more than 100 years. Choughs are joined by another very special bird, the Dartford Warbler, which has been found to breed in a few places on the Gower Coast; they are attracted by the extensive gorse and scrub habitats available on the clifftops and have quietly moved in, as they have in similar habitat above Port Talbot on the northern side of the M4 motorway. Closer to Port Eynon Point there are areas of gorse and scrub and the remains of a few quarries which attract other visiting birds. Stonechats, Whitethroats, and Rock Pipits can often be seen around this part of the reserve in summertime. If you visit this NNR in winter there is always a chance of seeing Black-throated Divers, Great Northern Divers, various auks, Common Scoter, Common Eider and Red-throated Divers in the sea close to the coast. 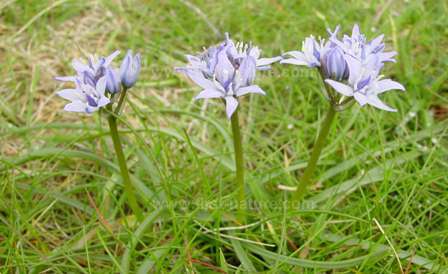 Maritime plants that grow in the reserve include Spring Squill, Tree Mallow, Sea Stork's-bill and both Rock Samphire and Golden Samphire. Rare plants that put in an appearance at Gower Coast NNR include Early Gentian, Small Restharrow, Goldilocks Aster, and Yellow Whitlow Grass which is more common in the Mediterranean and only found in a few places on the south coast of Britain. Three endemic Rock Sea-lavender species grow in the NNR, and the cliffs also have interesting lichens including Scrambled-egg Lichen (Fulgensia fulgens), which is a threatened species in the UK. In Wales this lichen can also be found at Stackpole NNR on the Pembrokeshire Coast. If you have enjoyed your visit to Gower Coast NNR, there are two other excellent NNRs closeby that you might alsolike to visit: Oxwich National Nature Reserve and Whiteford Burrows National Nature Reserve are both just a few miles away from Rhosili.